Our recent post about the corner of NE 15th and Killingsworth produced memories and comments from a number of AH readers which we were pleased to see, including a request for a bit more about Oakhurst, which we’re glad to oblige. Learning about these many plats/subdivisions is enlightening. 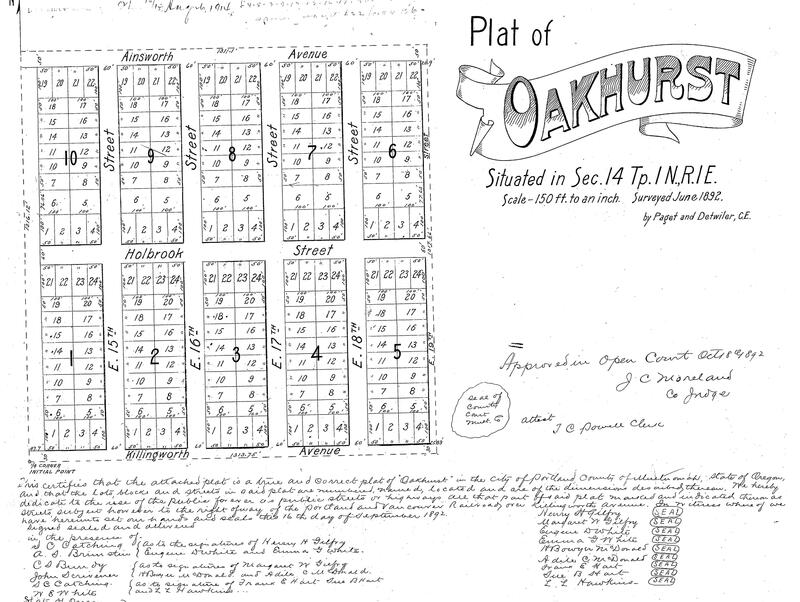 Detail of the official Oakhurst plat on file with the Multnomah County Surveyor. First, you’ll notice the fashionable graphic banner sporting the name. We’ve looked at hundreds of plats and have to say this is the most attractive graphic we’ve ever come across on a formal, dry plat document. Particularly from the 1890s. Next you’ll note all of the partners (and this is quite a crowd of partners), surveyors, commissioners and notary passed over the misspelling of Killingsworth. It was never “Killingworth.” They knew better. So much for attention to detail. You’ll also note there is no Jarrett Street: it shows up here as Holbrook Street. 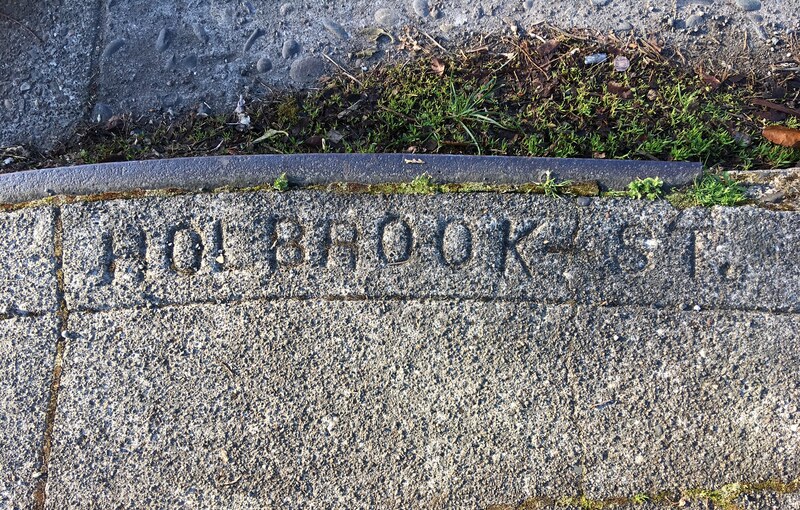 In fact, if you go looking, you’ll find Holbrook Street stamped into the curb at the northwest corner of NE 15th and Jarrett, even though it doesn’t exist. A now-extinct street name, set in concrete at NE 15th and Jarrett, April 2017. In fact, when the sidewalks were poured in 1911-1912, Holbrook Street had been off the books for four years. Was the cast-in-concrete mistake really a mistake, or do name changes just take a while to settle in among the locals? Merritt L. Holbrook was a realtor, banker and developer who worked in north and northeast Portland. The street name was changed by city ordinance on August 23, 1907, no particular reason given. Here’s our hunch: Jarrett Street already existed starting in today’s Arbor Lodge neighborhood and running east. As it passed through the Oakhurst plat, Holbrook was offset just a half block south. It was probably just easier to call it all one street than to have a short segment known as Holbrook. Jarrett, by the way, was Mark L. Jarrett, who owned property west of Oakhurst, and who platted his own 25-square-block subdivision between Ainsworth and Killingsworth, from North Michigan to the alley behind North Commercial called Jarrett’s Addition. Jarrett died unexpectedly at age 30 in October 1888 from smallpox while visiting family in Virginia and his estate—without a will—went through an ugly, drawn out probate process that makes for interesting reading in its own right, but doesn’t bear on Oakhurst. When you immerse yourself in the newspapers of the early days of Portland’s land boom (1890-1920) you quickly see a pervasive web of bankruptcies, lawsuits claiming money owing, delinquent taxes, land transfers and settlements. It’s clear these early speculators platting this open land were barely staying one step ahead of paper and financial obligations owed to someone else. Elsewhere in the newspaper, they appear together on the society pages being jovial, leading outings and picnics together, playing tennis, attending operas, lectures, teas and dinner parties, traveling to the coast or back east. Oakhurst’s incorporators are a perfect example: Henry and Margaret Gilfry (he the long term clerk of the U.S. Senate); Eugene and Emma White (he a realtor as well as the bond guarantor who bailed out J. Carroll McCaffrey of Foxchase fame on fraud charges, shake your head now); H. Boyer and Adile McDonald (he a real estate and life insurance salesman); Frank and Sue Hart (also real estate and insurance). By 1903 all of these individuals had been sued by their mortgage holder Portland Trust Company for taxes owing on vacant lots in Oakhurst. A couple of them paid, most of them didn’t and the lots were then transferred to Ainsworth National Bank (L.L. Hawkins, president…note his name as an incorporator on the plat…. a friend, neighbor and Portland socialite). It was a very small world. So there’s the history of the Oakhurst plat’s early days. Most of the land remained unbuilt well into the early 1900s, just curbs and streets. As Portland’s population boomed after the 1905 Lewis and Clark Exposition, lots were bought, houses built and Oakhurst began to come to life. Specific newspaper references to Oakhurst as a place begin drop off after these early years, though we know at least one pharmacist who thought the name would bring him business. Detail of a classified ad from the November 4, 1906 edition of The Oregonian.